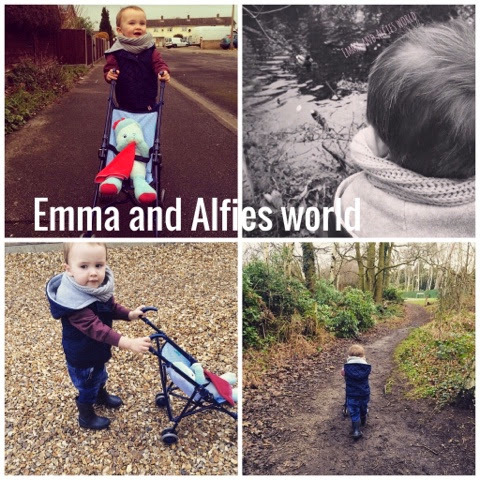 On Monday we went for a walk, alfie always wants to take the pushchair out with his toys in so I thought why not?. Usually Alfie gets bored when we're out walking, he starts moaning and crying and won't walk after about 20mins but his pushchair with igglepiggle in kept him occupied for longer than usual. While on our walk I taught him to stop, look and listen for cars. I thought he would maybe be to young to take it in but he surprised me and picked it up very quickly. In the end he stopped by himself and looked from side to side then looked at me and said 'yeah'. He's a little sponge, he takes everything in, I'll probably have to recap on our next walk because he might not remember what he learnt but he may surprise me and do it without any help. The last update was at 16months so he's developed a lot since then! He's changing and learning new things all the time. He's like a sponge- he takes everything in. Speech is amazing- he says a lot of words now and I know what he's saying. He will say stairs when he wants to go upstairs for something, even though he usually says that while he's running up the stairs already- he holds onto the bannister and is gone as quick as a flash. I find it hard to keep up with him a lot of the time! He can repeat any word you say to him, he even said caterpillar the other day! I was very shocked, he is very clever and I'm very proud of how easy he picks things up. He can get quite mardy, but I think this is the terrible twos- he shouts my actual name (Emma) when he wants something and I say no. 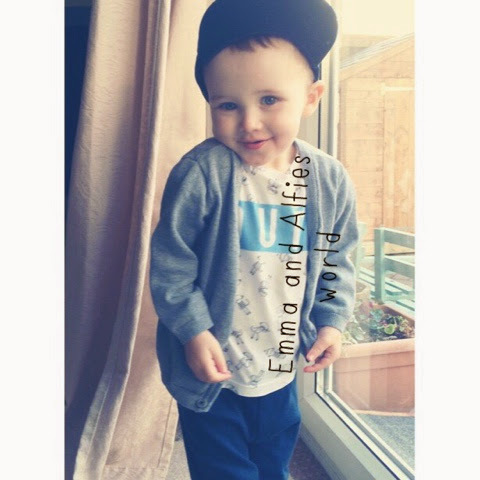 It's clever that he knows my name is Emma aswell as mummy but it's kinda annoying when your son is calling you by your name! Physically, he runs, walks and jumps. He loves jumping in muddy puddles like his favourite character peppa pig. He can climb in and out the car with very little help. 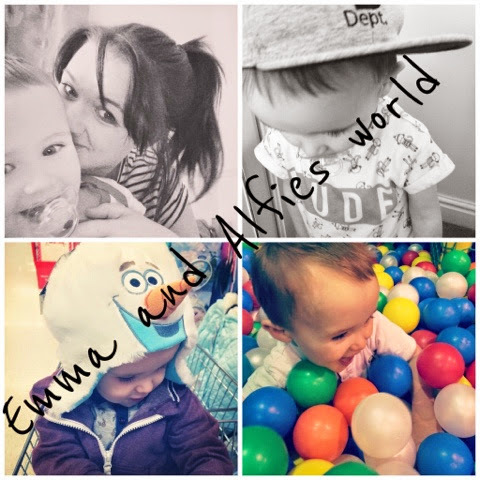 He's so very independant now and while I'm writing this im actually just realising how grown up he really is. I don't really get chance to sit down and think about all his achievements but now I am sat here writing about them ive realised he's actually a little boy now!! He is in 12-18 clothes and size5 nappies. I'm hoping to potty train soon so if anyone has any tips- they would be greatly appreciated! We do have a potty but he doesn't really use it, I get him to sit on it before his bath but we are still waiting for something to happen on it. We still have a 'dum dum' (dummy), im hoping to get rid of that soon but he asks for it quite a lot so I think it may be hard to get rid of!! Dreading it. He's become very affectionate these past few weeks, he asks for cuddles and will just randomly give you a kiss without needing to ask for one. He's a very loving little boy and it absolutely melts my heart when he wants a cuddle. Bedtime has been a nightmare lately, he's been in my bed for a couple of months now as before Christmas he did have a few illnesses that meant he was up all throughout the night. I didn't mind at the time but now he wakes up in the middle of the night and shouts me to get him. I know I need to grow a backbone and just try and leave him there to self settle again, but that's not option at the moment as living arrangements aren't great so I have to keep him quiet. -heads shoulders knees and toes song- he loves this song and can point to every body part. So very proud. -in the night garden and peppa pig are his favourite programmes. He oinks whenever he sees anything peppa pig!! -mummy's bed, he does love being in my bed, I don't think I would like to sleep in a cot with bars surrounding me. Maybe we will think about putting him in his own big boy bed soon- how old were your little ones when you put them in a toddler bed? -singing. He sings in the car, obviously it doesn't sound like anything to anyone else but he sings and claps and waves his arms around in the back of the car! -Fruit, he's obssesed with fruit. Any fruit- he would much rather have fruit than chocolate or sweeties. 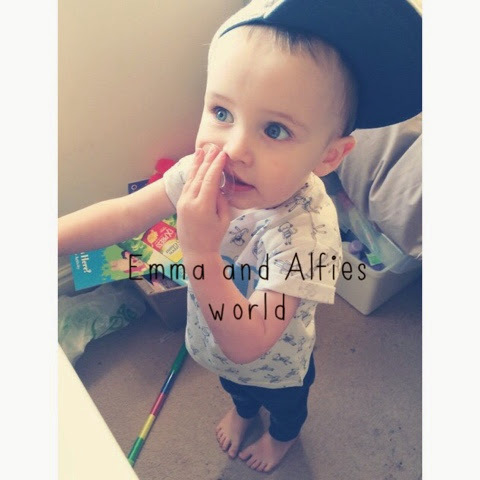 Hopefully in the next update alfie will be dummy free and we will have started the potty training. Wish me luck!! 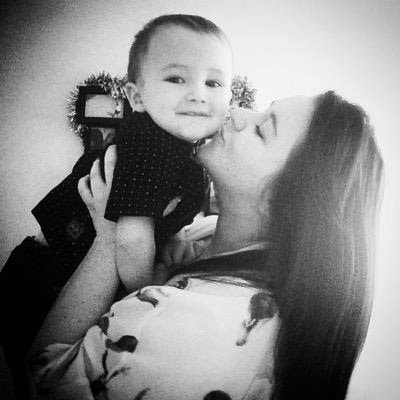 I love dressing alfie up, when I found out he was boy I was so scared that I wouldn't be able to dress him nicely and assumed a girl would be easier. 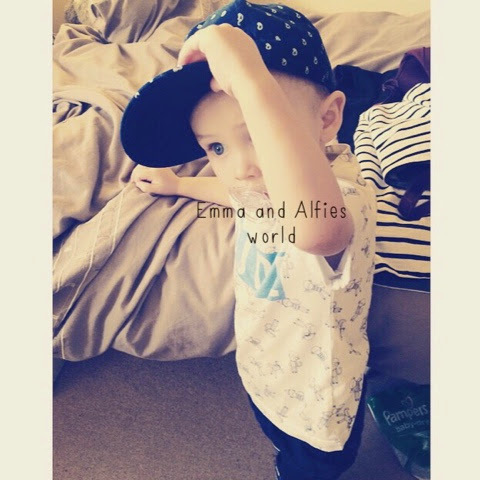 Now I have alfie I couldn't imagine having a girl and much prefer boys clothes! 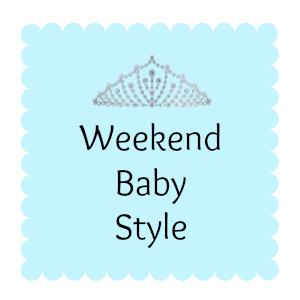 Today I'm joining in with Hannahs (first time mummy) weekend baby style linky. We have gone for quite a relaxed look, I like him in leggings. 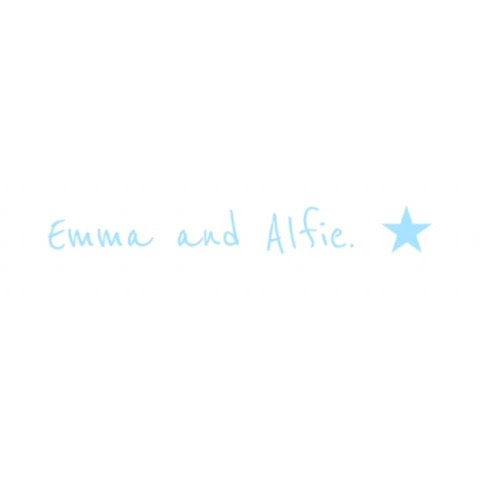 If we're not doing anything special then comfortable clothes are key! Leggings are a wardrobe staple for little ones at the moment!